I know that I normally post about writing, or try to keep my posts light and whimsical, funny, and satirical on this blog, but today is special. I want to take this opportunity to thank those who served our country in a way that nobody else can. The majority of those who serve do not come from wealth, they are not paid like senators or congress persons. They do not have the opportunity to give themselves pay raises or extended benefits but must struggle to live on the pay and benefits bestowed on them by those who, in most cases, have not served. I want, more than anything, for America to understand that our Soldiers, Sailors, Airmen, and Marines, have the same beliefs and desires as other Americans. Only, they must remain silent and vigilant, in order to preserve the right of others to voice their opinions. A young man or woman deciding to serve should not be seen as some lack of humanity in their souls. On the contrary, they who serve have a deeper soul then most; and it must be deep because they must forever harbor and suppress those things they see and do that others were unwilling to commit to. So during this Veteran's day, I am thankful each time a stranger shakes a veteran's hand on the street and thanks them for their service. I know this one small kind gesture can make all the difference in the heart on one serving, always prepared to make the ultimate sacrifice for that stranger on the street. And some continue to sacrifice even after their death when so-called 'religious' groups protest while their families merely attempt to bury their loved ones with honor. A heartfelt thank you is wonderful, but I would ask that Americans take it one step further. Thank a veteran after Veteran's day. Listen to them, Let go your preconceived notions of what a soldier is and reach out to them, give them opportunity, give them jobs upon their return so that they may preserve their dignity. I say this because the unemployment rate of veterans is twice that of the nation. This simply should not be, and it expresses beyond words, how the majority of Americans (in the position to give jobs) really feel about those willing to give so much to others. Please Americans, try to understand that those who served, and especially those returning from recent action, should not be looked upon as some kind of emotionless monster. Our soldiers today are not merely machines, they are sentient soldiers with feelings, thoughts, desires, like everyone else. The only difference is that soldier must put aside their personal beliefs and feelings in order to preserve the right of others to freely express that which they themselves cannot. I know this because I am also a veteran. I served for twenty-two years in military service. I might add that my family also served. They were right along side me every step of the way. They remain with me, even today, as I continue to make adjustments to civilian life, with its freedoms and responsibilities. My own son currently serves, and I could not be more proud of him, for I know that through his daily duties, he continues to provide me and other civilians with a measure of freedom and stability not found anywhere else on this Earth. I know because I've been to many other countries, and found, despite outside appearances, that they simply do not have what we have here. My son's girlfriend also serves, and my thoughts are with her as she is overseas. My thoughts are with her family as I know what they must feel having a soldier serving for their good. I know the strange mix of pride, gratitude, and fear they feel. We all must remember, today and everyday, that a person who served, or is serving their country, is not some mindless machine. they are people like you and I. It may seem to some that they have no thoughts, feelings, or desires, but one must remember that they are trained, and willingly accept that training, in order to do things many others are simply unwilling do do. So, as you walk about today, viewing parades and shaking the hand of those that serve, try to remember that they are the true saviours of your freedoms; not some politician. For, unlike those in the service of making laws they themselves are not accountable to, a soldier is one willing to serve, and yes, even die, in support of those laws without the benefit of many of the freedoms provided to the American citizen. In other words, make sure that handshake means something beyond pressing flesh. 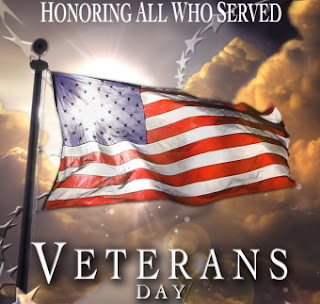 Take the time to think about the freedoms you have and then go back and truly thank a veteran for those freedoms, for they are more like you than those that legally provide you those freedoms.